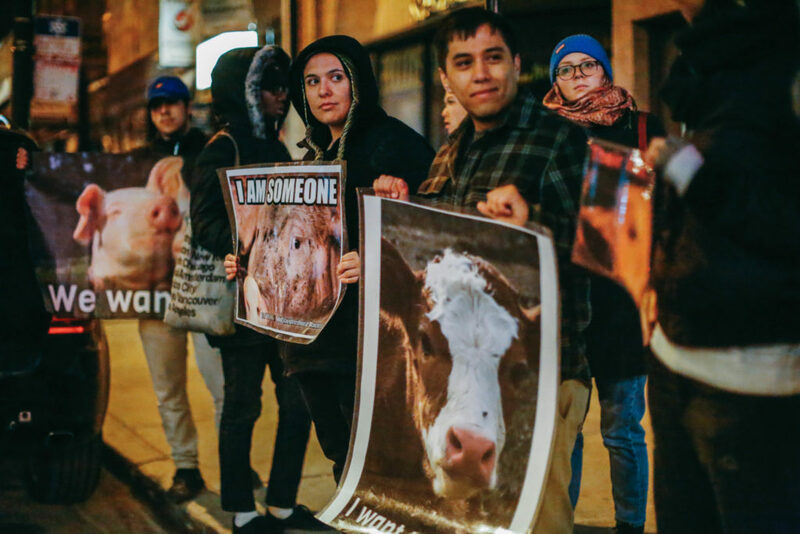 Chicago Animal Save uses vigils to “bear witness,” but it also wants to close all Chicago slaughterhouses, which numbered eleven in 2015, according to WBEZ. The group was formed two years ago, when North Sider Kelsey Atkinson was contacted by a woman from Back of the Yards about staging a protest against a nearby slaughterhouse. Atkinson organized the first vigil—signaling the group’s formation—at the Halsted Packing House, a few blocks north of the Fulton Market District. Five people came both to protest animal slaughter and deduce the schedule of delivery trucks for future vigils. At 4am, the truck arrived. Atkinson recalled the animals were unexpectedly young. “Some pigs and lambs were small enough for me to scoop into my arms,” she said. Conditions inside delivery trucks are generally filthy. “We usually see excrement and vomit smeared across the walls or dripping through the sides of the truck,” Atkinson explained. “Many animals lie in the waste and seem too weak to move.” Outside one slaughterhouse, animals were forced to wait in subzero temperatures before they were brought inside to be killed. One of the animals froze to death. “We have never seen the workers give the animals food or water,” said Atkinson. Atkinson had previously undertaken more immediate action, such as disruptive protests inside grocery stores and food festivals, with animal rights group Direct Action Everywhere. But she found that people with first-hand experience of animal abuse gave speeches with far greater impact. The group also reached out to aldermen in neighborhoods containing slaughterhouses, but Atkinson said aldermen didn’t want to engage with their work. Alderman Walter Burnett of the 27th Ward met with the group, but hadn’t seemed interested in helping them, Atkinson said. According to Atkinson, Proco Joe Moreno of the 1st Ward didn’t even respond. “I feel like if the slaughterhouses were seen as a detriment to more desirable businesses in the neighborhood, then the aldermen would start to care more,” said Atkinson. support and momentum. In addition to vigils, the group organizes community activities such as sanctuary visits, documentary screenings, and vegan potlucks. It also focuses on community outreach through partnerships with local organizations like Hip Hop Is Green, which aims to make a vegan lifestyle accessible to Chicagoans and the young. Chicago Animal Save also exposes animal cruelty through its YouTube channel, where the group has posted several videos on slaughterhouses. One video, a look inside a Chicago slaughterhouse, contains footage of panting chickens with infected, featherless patches of skin in small cages full of feces. The video documents their slaughter: they’re rotated through a vat of boiling water, and then tossed, often half alive, into a metal grinder. During vigils, activists try to engage with slaughterhouse workers, who appear desensitized to animal death in the group’s videos. 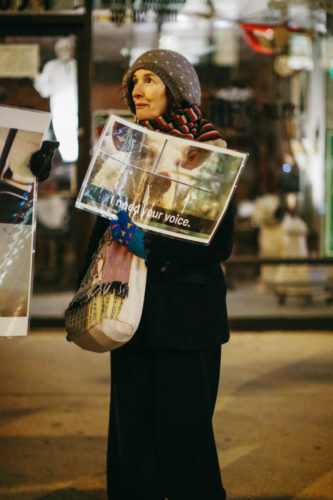 Through Chicago Animal Save stresses that people should be held accountable for slaughter, Atkinson said that the group makes its nonviolent ethos clear to volunteers and activists before each vigil. “We’re here to attack the system, we’re not here to attack individuals,” said Atkinson. While most workers ignore the activists or get angry, some speak to them, particularly when the activists chant in Spanish. They are often told by workers that “this is just my job, I need to feed my family.” Atkinson noted that truck drivers and slaughterhouse workers often deny any responsibility over the matter and reiterate that they are just doing their jobs. “They just wanted us to leave them alone,” she said of the employees. If the suffering of animals weren’t enough, slaughterhouse employees often labor in dangerous and repetitive conditions. Workers frequently suffer from lacerations from sharp equipment, and the repetitive nature of the labor often leads to stress injuries on the hands, arms, and back. Workers are also exposed to the blood, guts, and feces of animals, putting them at risk of contracting various diseases. Chicago’s slaughterhouse working conditions prompted protest at the beginning of the twentieth century, most notably in Upton Sinclair’s The Jungle, written in 1906 as an exposé of workplace conditions in Chicago’s Union Stockyards. Chicago Animal Save joins a long line of animal welfare organizations based in Chicago. The Illinois Humane Society, founded in 1869, often worked with health inspectors and obtained an office in one slaughterhouse, allowing them to observe and report on any animal cruelty. In 1874, the group reported that they had “admonished nearly two thousand persons for unnecessary cruelty to animals,” as Columbia College Chicago historian Dominic Pacyga wrote in Slaughterhouse: Chicago’s Union Stock Yard and the World it Made. Another organization, the Anti-Cruelty Society, was founded in 1899 and prompted by women connected to the contemporary suffrage movement. Their goals were to suppress cruelty against animals and educate the public on humane treatment. But despite the legacy of animal activism in Chicago, there is a degree of separation between Chicago’s different animal welfare groups. Atkinson said she had attempted to connect with the Anti-Cruelty Society to report the abuses against animals she had witnessed on slaughter trucks, but had gotten no response. When asked about the group’s successes, Atkinson acknowledged that change comes slowly. Atkinson stated that the group’s presence at slaughterhouses had caused trucks to drive away on three occasions, sparing animals’ lives for the day and causing a disruption to slaughterhouses. She also cited the mere presence of the group as a success. Jade Yan is a contributor to the Weekly. She is from Hong Kong and currently a freshman at the University of Chicago, where she is involved with the Institute of Politics and writes for the Chicago Maroon. This is her first story for the Weekly. Thanks for the great coverage and story Jade! If anyone wants to reach out to me and learn more or get involved, please send an email to chicagoanimalsave@gmail.com ! Great article! Thanks for covering this very important topic and thanks to Chicago Animal Save for their excellent work! Thank you for covering all the great work that Chicago Animal Save is doing!